Eine 2013/14 Panini Spectra Basketball Hobby Box mit 1 Pack Per Box, 8 Cards Per Pack. 4 Autogramm-Memorabilia Cards und jeweils 1 Memorabilia und Parallel Card per Box ! 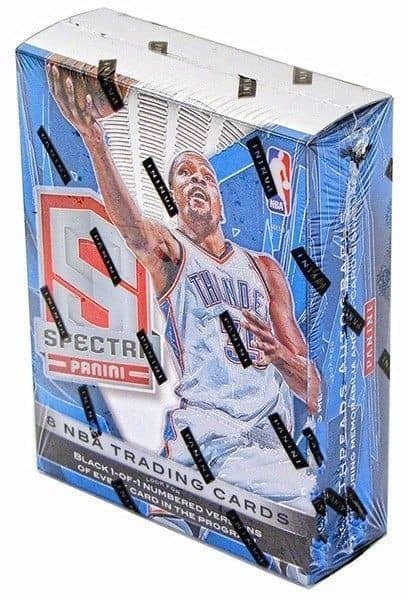 Produktinformationen "2013/14 Panini Spectra Basketball Hobby Box NBA"
Spectra features a robust checklist printed entirely on thick optichrome cards. Every box delivers on average four Autographed Memorabilia cards, one Memorabilia card, one parallel #'d/65 or less, and two base cards #'d/199! 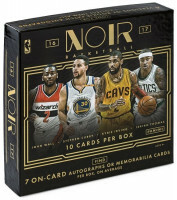 Every box delivers at least one base parallel or variation card, including Blue #'d/65, Red Die-Cut Variations #'d/25, Gold #'d/10, and Black #'d/ One of one! Loaded with memorabilia cards, including the giant swatches on display in Materials and Rookie Jumbo Jerseys! Look for black one of one parallels! BASE SET: Collect the Rainbow of your favorite player in Panini's most prestigious Optichrome program! ALL-STAR JERSEY AUTOGRAPHS: Can't get enough of the star-studded All-Star weekend? Spectra's got you covered with this set, featuring only NBA All-Stars. ROOKIE JERSEY AUTOGRAPHS: Look for the NBA's brightest young star paired with a sizable swatch in this auto/mem hit! SPECTACULAR SWATCH SIGNATURES: Spectra features the most spectacular stars in this autographed memorabilia set. Find Kyrie Irving and a host of other stars! MATERIALS: Score a Jumbo Prime swatch of the league's best, all #'d/10 or less! ROOKIE JUMBO JERSEYS: Get a super-sized slice of one of the NBA's future legends in this jumbo memorabilia set! With prime versions, #'d to 10 and 1! Weiterführende Links zu "2013/14 Panini Spectra Basketball Hobby Box NBA"
Fanbewertungen für "2013/14 Panini Spectra Basketball Hobby Box NBA"